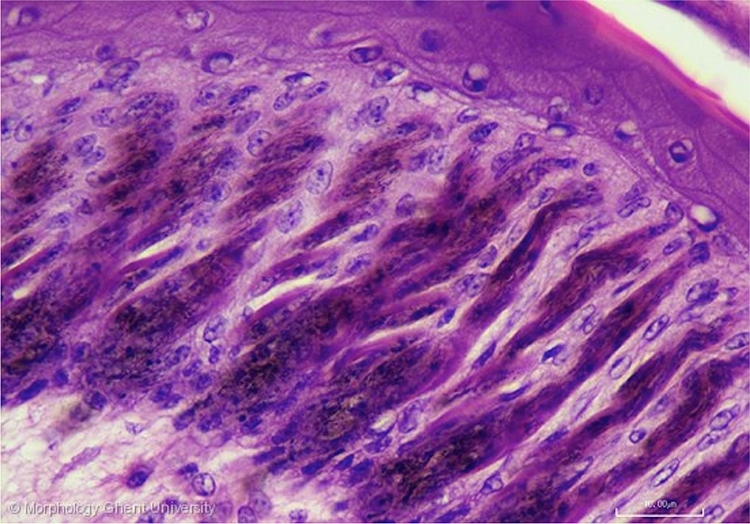 Remaining basilar cells are united again to form a continuous temporary secondary layer of pulp epithelium. Inside the barb ridges, cells in the peripheral region proliferate and differentiate to form two barbule plates separated by an axial plate. The barbule plates will become the barbules, in which individual cells will undergo cell shape changes to form cilia and hooklets. The axial plate cells will die and form the intervening space. The inner part of the barb ridge close to the pulp that doesnâ€™t take part in formation of the barbules will become the ramus. At the micrograph above, the cells in the barbule plates are pigmented.